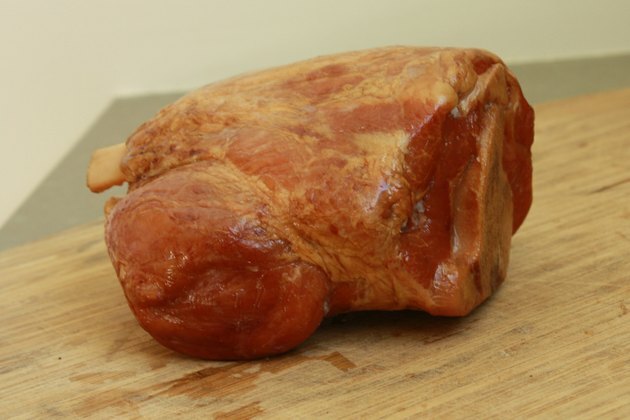 A ham shank -- more accurately known as a pork shank -- is a bone-in cut from the front leg. Although it's often referred to as a ham hock, hocks are a different cut and are typically cured, whereas shanks are often available fresh. Pork shanks are inexpensive and flavorful, though Food & Wine writer Tim Love cautions they'll turn out unpleasantly chewy unless they're cooked slowly in liquid. Pork shanks are high in fat: Eat them only occasionally and in moderation. 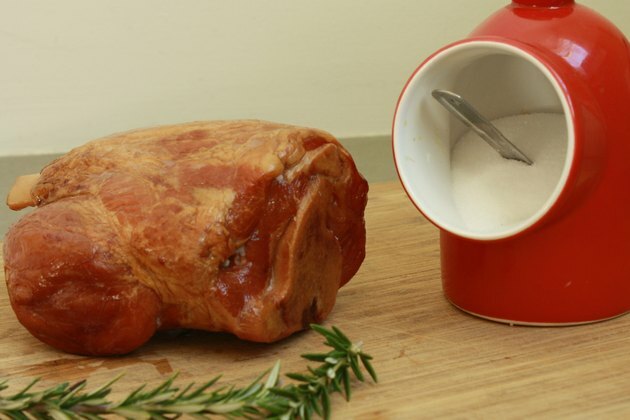 Season the pork shank all over with salt, pepper and your choice of seasonings, such as minced garlic cloves or chopped fresh herbs like rosemary. 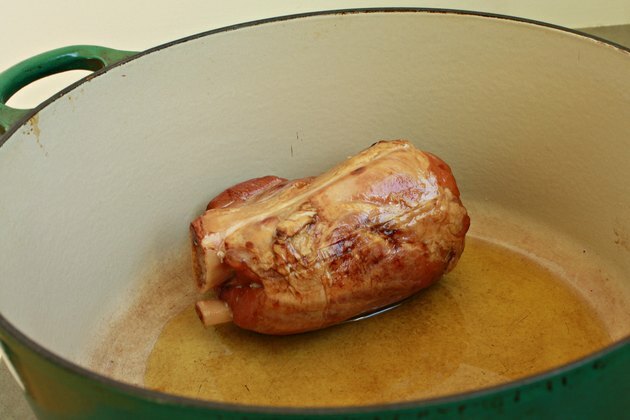 Heat olive oil in a Dutch oven or a large, oven-safe pot, using approximately 4 tablespoons of oil for one 1 1/2- to 2-pound pork shank. Add the pork shank and brown it on all sides for approximately 15 minutes, using tongs to turn the meat. 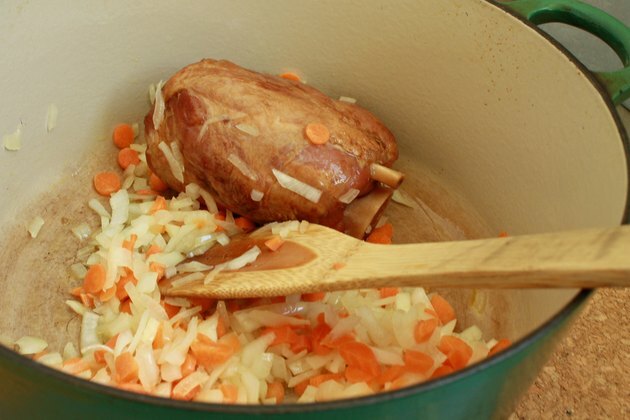 Push the pork shank to the side of the pot and add chopped onions and chunked vegetables such as onions, carrots or celery, if desired. Saute the vegetables briefly. Arrange the vegetables evenly around the pork shank. 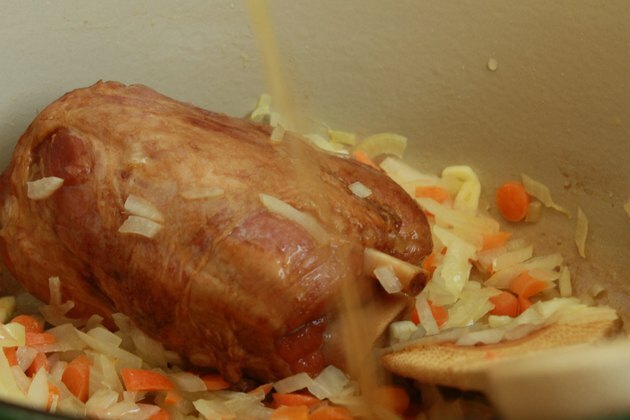 Pour in approximately 2 cups of liquid for a 1 1/2- to 2-pound pork shank, choosing from wine, broth, beer, water or a combination. Put the pot's lid in place, or cover the pot securely with aluminum foil. 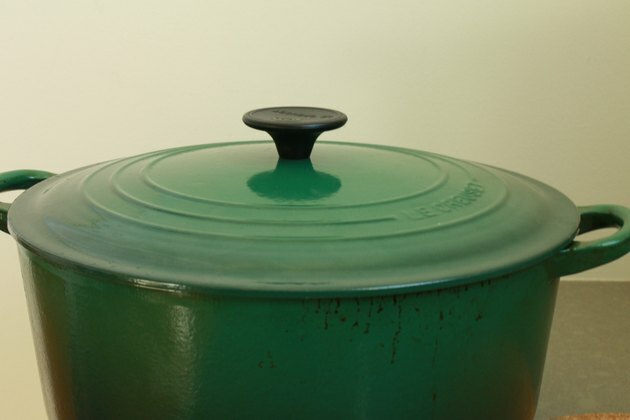 Place the covered pot into an oven that has been heated to 325 degrees Fahrenheit. Allow the pork shank and vegetables to cook for approximately three hours, using the tongs to turn the shank over halfway through the cooking time. Remove the pot from the oven when the meat is tender and a meat thermometer inserted into the thickest part of the shank registers at least 145 degrees Fahrenheit. 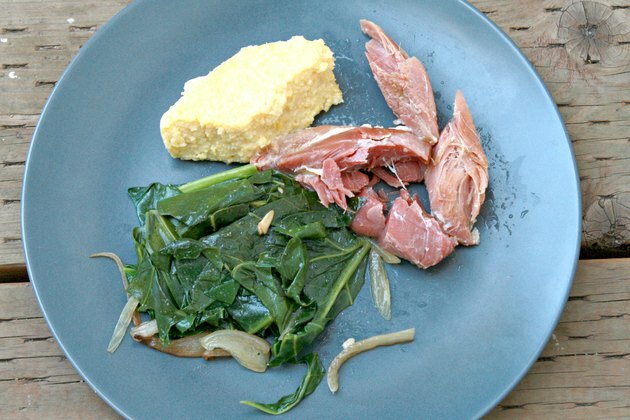 Discard the bone and serve the meat and vegetables with whole-wheat pasta, polenta or brown rice. Plan on a 1 1/2- to 2-pound pork shank being enough to serve three to four people. 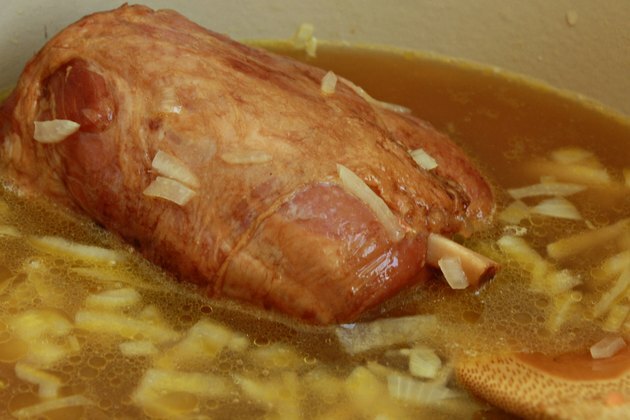 To serve the pork shank with a sauce made from the accumulated pan juices, put the pot on the stove top after removing the meat and vegetables, bring the liquid to a boil and whisk in 1 or more tablespoons of flour. Try oven-roasting the pork shanks with rinsed and drained sauerkraut for a German-inspired dish, recommends the Pork Be Inspired website. A pork shank is not considered a lean cut of meat since it contains more than 10 grams of fat, 4.5 grams of saturated fat and 95 milligrams of cholesterol in every 3-ounce serving. Don't confuse a ham or pork shank with a bone-in smoked shank portion ham cut. A shank ham cut ranges between 5 and 10 pounds and is usually glazed, oven-heated and served to groups for large dinners.